The Invergordon Archive - Heave Ho! Tug o' War - date unknown but the building in the background may help to identify the location. Black Park with distillery warehouse in the backgound on other side of the railway?? Must be 1960s with distillery warehouses in the background. There used to be a Distillery Games held annually in the field across the road from the grounds of the Leisure Centre, I think. 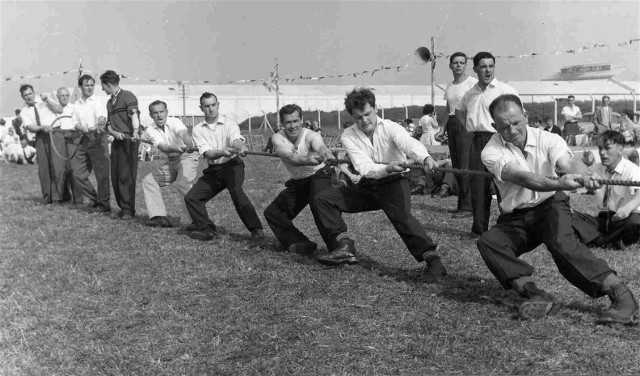 Distillery sports day tug o' war: my late father Gerry Rowe standing in white tee shirt. Is that Hughie Ross sitting in the middle right-hand corner of the picture? Yes John, that is Hughie Ross sitting.